Limbic Entertainment takes its second swing at the Might & Magic Heroes franchise, this time without the help of Black Hole Entertainment and Virtuos. What began as an offshoot of the once-hugely popular Might and Magic RPG series has long since eclipsed its progenitor to become the iconic property in the franchise. 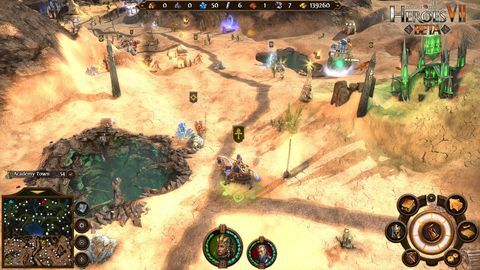 While it’s suffered a few bumps along the way after changing developers and publishers, Might and Magic: Heroes maintains a loyal fan base. For the uninitiated, the Heroes series is a turn based tactical and strategy title wrapped in a fantasy setting rife with racial and factional conflict. The forces of good and evil, the living and the dead, and the hosts of heaven and hordes of hell all vie for supremacy in the world of Ashan. The Heroes games have always been built on two gameplay pillars. The first: an over-world strategic game where you will guide your heroes across the land to collect artefacts and resources, and capture and defend towns. These towns can be upgraded to produce varied units for your hero army, and they also improve core hero abilities and the defensive capabilities of the town itself. 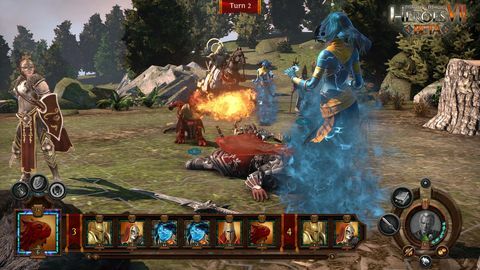 The second gameplay pillar of Heroes is the tactical combat. Here you will control your hero’s army in turn-based combat against a multitude of foes from the mundane to the wildly exotic. Movement in the main map is a simple point-and-click affair, and your hero traverses the world collecting items and resources, and encountering neutral or opposing armies. At the end of each turn, your enemy will also be able to move about the world, and like you, he or she can engage in combat with armies on the map, collect items, and capture towns. Being mobile and managing your turns, resources, and units is vital lest the opposition wrest control of the map from you. Once you engage an opposing army, the view shifts from the over-world map to a 10x12 grid. Here you will direct your forces in turn-based combat against opposing heroes or a roaming monster. Mechanically, Heroes VII is virtually identical to the previous Ubisoft-published Heroes titles, but a general lack of polish and care only makes it all the more obvious that this is a game desperately clinging to its former glory than one looking to forge its own path. It’s inferior in every way to every other entry in the series – a barebones rehash of old ideas that can’t even claim a graphical upgrade to hide the fact it does nothing new. In many cases, it doesn’t even manage to execute the basics well. There are a multitude of bugs and performance issues. Sounds skips or drops for no reason. Loading the game takes far longer than it should. Visually, it’s bland and noticeably inferior to the last game. These things don’t always feel like a failure from the developer, but instead appear to be the consequence of too little time and money spread across too much game. The list of problems goes on: the campaign cinematics completely lack any character animation. The core campaign is dull, plodding, and in desperate need of an editor. While there is a massive amount of content, it’s completely uninteresting. Every map are poorly laid out, and pulling the camera back to get a better lay of the land drops a light fog across the entire viewable area, rendering the view essentially useless. In combat, things fare no better. While it’s the same system fans are used to, it feels more dated and less compelling here due to various cut corners and a general lack of polish. Units are bland and poorly animated, each combat zone feels generic, and there are plenty of muddy textures and a general lack of artistic flair. Unit portraits also suffer from being poor quality and low resolution. In short: everything here feels like an inferior version of what was available in previous games in the series. Tellingly, when I was done with playing Heroes VII, I had the urge to reinstall Heroes VI. I did so, and it’s a vastly more interesting and entertaining game. It’s sad that the Heroes fan base has been let down with the release of Might and Magic Heroes VII. An unfinished, bug ridden bore, it feels more like a budget release than a major title from a large publisher. Ups Plenty of content. 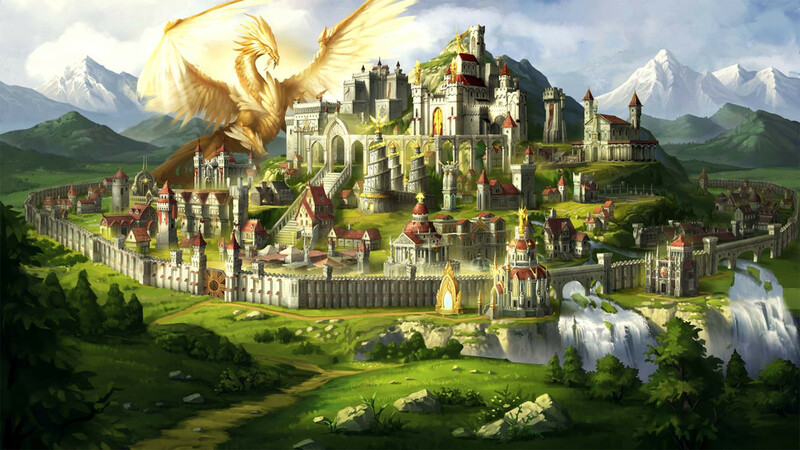 Upgraded towns look stunning and there are moments that capture that old-school magic and might of previous Heroes titles. Downs Everything feels rushed and incomplete. Lacklustre graphics and sound. Bland and poorly written story. Does not look or feel like the AAA game it should have been.